We know that Jesus died on the cross for our sins, but what happened after that? Did Jesus really rise from the grave? Is He alive today? If so, where is He now? We will find the answers to these questions in this lesson. The Lord Jesus died about three o'clock in the afternoon. His body was taken down from the cross, and He was buried in the tomb of a rich man. This tomb was a cave in the side of a mountain. They rolled a big stone in front of His tomb. Jesus was in the tomb three days. Early in the morning of the third day, while it was still dark, the Lord Jesus rose from the dead. There was a great earthquake. An angel came from Heaven, rolled the stone back, and sat on it. "Fear not: for I know that you seek Jesus, which was crucified. He is not here: for He is risen, as He said. Come, see the place where the Lord lay" (Matthew 28:5-6). The three women were very excited. They ran back to tell the disciples. They met Peter and John and told them what they had seen and heard. Peter and John ran to the tomb. When they arrived and looked inside, they saw an amazing sight. The body of Jesus was gone! The linen cloth, which had been wrapped around Jesus' body, was lying there. He had risen! Later, Mary Magdalene came back to the tomb by herself. She was crying her heart out. Suddenly she realized that someone was standing near. She thought it was the gardener, and she asked him where they had taken the body of Jesus. But it was not the gardener; it was Jesus Himself. He said, "Mary!" She recognized the Lord's voice, and she turned and said, "Master!" Then she ran and told the disciples that she had seen the Lord. That night ten of the disciples met in an upper room. Thomas was not there. They had the doors shut because they were afraid. Suddenly Jesus came and stood in their midst. He said to them, "Peace be unto you." The disciples thought they were seeing a spirit and not a real person. 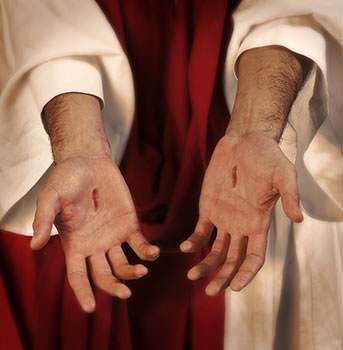 Jesus showed them His hands with the print of the nails in them and His side with the spear wound. Jesus told them to look at His hands and His feet. He told them to touch Him, handle Him, and see that He was a real person with flesh and bones and not a spirit. To further show them that He had a real body, He sat down and ate fish and honey with them. The Lord Jesus was the same Person whom His disciples had known and loved. But now He had a glorious, new resurrection body. In His powerful, new resurrection body, Jesus could go from one place to another instantly. He had a real body that you could see and touch and handle; yet He could go through locked doors. The ten disciples were filled with joy. 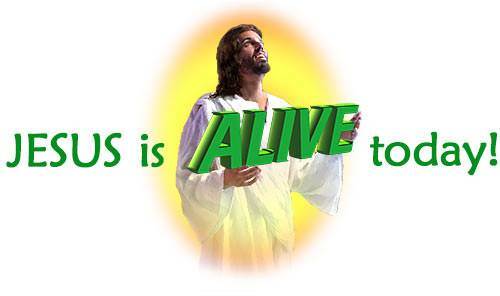 Jesus was alive again! They found Thomas and told him the good news. But Thomas did not believe them. 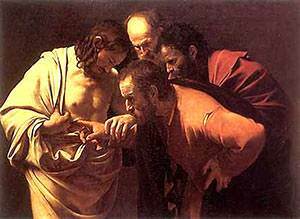 Thomas said, "Except I shall see in His hands the print of the nails, and put my finger into the print of the nails, and thrust my hand into His side, I will not believe" (John 20:25). Eight days later, the disciples were again in the upper room. This time Thomas was with them. Jesus appeared to them again and said, "Peace be unto you." Then He turned to Thomas and said, "Thomas, behold My hands. Put your finger in the nail prints in My hands! Put your hand in the spear wound in My side! Don't doubt any longer. Believe!" Thomas felt ashamed that he had not believed. He worshiped Jesus, saying, "My Lord and my God" (John 20:28). 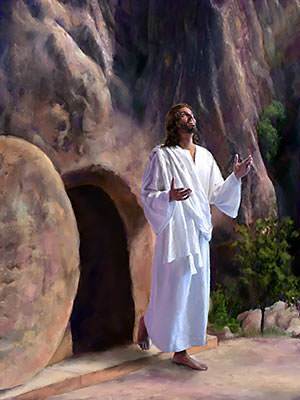 The Lord Jesus appeared on the earth for forty days after He rose from the dead. He appeared to His believers many times. He was seen by many people. On one occasion, over 500 people saw Him after He rose from the dead. The resurrection of Jesus Christ proves that He is who He said He was—the Son of God. The Bible says that Jesus Christ was "declared to be the Son of God with power…by the resurrection from the dead" (Romans 1:4). When it was time for Jesus to return to Heaven, He told His disciples to meet Him on a certain mountain. When they came and saw Him, they worshiped Him. Jesus said to them, "All power is given unto Me in Heaven and in earth" (Matthew 28:18). 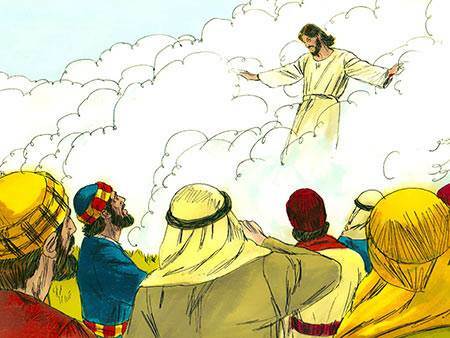 Jesus blessed His disciples, and, as they watched, He went up, up, up into the sky. They watched Him until a cloud hid Him from their sight. Their beloved Jesus had gone back to Heaven. While the disciples were standing there, looking up into the sky, two men in shining white clothes appeared to them and said, "You men of Galilee, why do you stand looking up into Heaven? This same Jesus, who was taken up from you into Heaven, shall so come in like manner as you have seen Him go into Heaven" (Acts 1:11). Today Jesus is in Heaven, in His glorious resurrection body, seated at the right hand of God the Father. He has all power in Heaven and in the earth. Some day He is coming back to take us to be with Him in Heaven forever. This is the Person whom God wants me to believe in, love, and have as my Savior, my Lord, and my special Best Friend. Jesus rose from the dead in a glorious, new resurrection body. Jesus has all power in Heaven and in the earth. Jesus is in Heaven today, seated at the right hand of God the Father. Jesus is coming back some day to take us to be with Him forever. At Sunday school Maria asked God to forgive her and received Jesus as her Savior. She knows that she must tell her teacher about her lies. At school the next day, Maria says, "Miss Wilson, I have to tell you something." "Maria, I would like to talk to you," Miss Wilson said with a rush, "but I have to go to a teacher's meeting right now. You will have to come in to see me before school. Run along now and we will talk in the morning." Maria's heart sank. 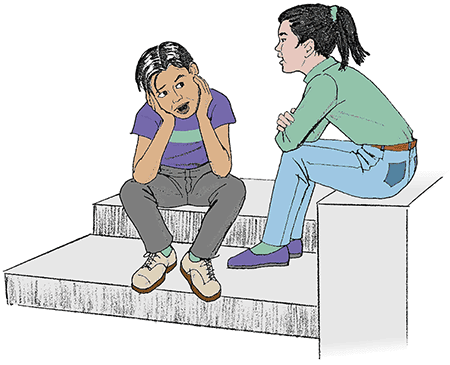 It took all day to build up her nerve to confess her lies to her teacher and now she had to wait until tomorrow. How could she get through this! It seemed like things should be getting easier instead of more difficult. As Maria reached the school gate, Susan came running up to her. She looked worried. "Maria," she asked, "why were you talking to Miss Wilson? Has she found out about what we did?" "I was going to tell her what I did," Maria said. "But she did not have time to listen now." "Maria Ortega! Are you going to tell her about me, too?" Susan started to cry. Maria began to explain how she had taken Jesus as her Savior. 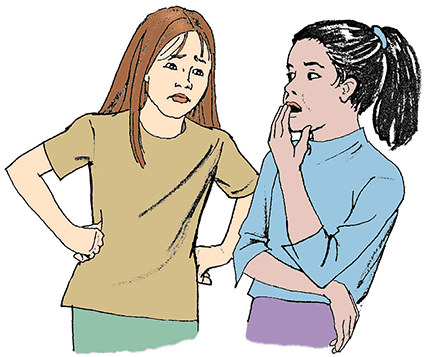 And that now she wanted to tell the teacher about the wrong things she had done and say she was sorry. But Susan did not understand what she was saying. "I think you are real mean, Maria," she said. "If you tell Miss Wilson, she will not let me be in the camp contest. And I suppose you will tell your mother about the sweater, too. I will have to give the beautiful red sweater back to you. How could you do this to me after I helped you go see your grandmother?" Maria caught her breath. She had not thought of all the consequences of what she had done wrong. Susan did make it possible for her to sing for her grandmother. She also knew she should tell her mother about the sweater. Maybe this was not the way to show Susan how she appreciated her help, Maria thought. "I will beg Mommy to let you keep the sweater, Susan," Maria promised. "And I will tell Miss Wilson that everything was all my fault on Friday. I do not think she will blame you. Please don't be mad at me, Susan," Maria pleaded. Susan's face was like a storm cloud. "I am mad at you, Maria!" she said. "And if you go and tell everything you will be sorry!" She quickly turned around and ran down the street. Maria did not go home so quickly. She wondered if things could get any worse. Soon she turned the corner and slowly walked through her front yard. "Hi, Maria!" Steven called as Captain chased him around the corner of the house. "How was school today?" he asked giggling at Captain. "Oh, all right I guess," she answered with a sigh. Steven stopped and stared at Maria, then asked, "What is wrong with you? You look like you lost your best friend." "I think I did, Steven. I have done some terrible things. I am in a lot of trouble. Now Susan is very upset with me. I don't know what I am going to do." Tears rolled down Maria's face as she began to cry. "I am sure things will work out with Susan. You can't be in THAT much trouble!" Steven said, doing his best to comfort her. "Yes I can, Steven." Maria insisted. "I have to tell someone about all the things I have done." Steven and Maria walked over and sat down on the front porch. With a deep breath Maria began to tell Steven about the torn list and how she got Susan to lie by giving her the red sweater. "Whew!" Steven burst out, "What a mess! You really are in big trouble. You have to tell Mother everything and she will be very upset with you. Your teacher could also be mad at you, and then there is Susan. I know you like her a lot. I wonder if this is the kind of trouble my Sunday School teacher was talking about?" "Now, what are you talking about Steven?" Maria asked. Steven began to talk softly to Maria, "On Sunday, my teacher said that we can give our problems to Jesus. "Three days after Jesus died, He rose from the dead. Then He went to Heaven. "Today Jesus is alive and sitting at God's right hand. Because He is alive, we can give our problems to Jesus and He will listen to us. My teacher told us to memorize 1 Peter 5:7 from the Bible. If we have troubles then we can remember the verse. It says to 'Cast all your care upon Him; for He cares for you.' Maybe I memorized the verse so I could tell it to you now." "Thank you, Steven. My teacher told us the same thing—that we can always take our troubles to Jesus." After supper Maria had a chance to talk to her mother about the sweater, but she could not find the words to tell her. In bed, Maria tossed and turned, trying to think of what to tell Miss Wilson and what to say to her mother. She was worried about Susan being so mad at her. Then she thought of the verse Steven had shared with her. Maria got up and knelt down next to her bed. She began to tell Jesus about all the trouble she was in. "Dear Jesus," she prayed, "I am so glad You are alive and can listen to me. Please help me to do what is right." Then she got back into bed and went to sleep. Will Maria be able to tell the truth? Will Jesus give her the courage she needs? Will Susan be able to forgive Maria? Find out in the next chapter—with your next lesson! Now click on the Questions link below so you can do the questions.